I’m one of the few people who, upon hearing about Iron Man/Tony Stark being made a co-lead in Captain America: Civil War, felt more apprehension than elation. It isn’t that I hate Tony Stark or Robert Downey Jr. in the role—although I have grown a little tired of his bad-boy, anti-hero dominance thing—but the Captain America films were my favorite of the Marvel standalone films, and Winter Soldier’s one of my favorite action movies. I think Steve Rogers is a strong enough character to carry a movie, and I like the characters that have surrounded him in the previous films, especially the core connection he has with Bucky Barnes. Adding Tony felt like a threat to a sequel I really looked forward to, and while my worst fears weren’t met—far from it in fact—I have to admit this is a step down (small perhaps) from its predecessor. As an Avengers film, this is one of the best, but as a Captain America film, it falls a little short. It would be unfair to give much away about the new films, except to say Civil War essentially carries on what was set up in both Captain America: Winter Soldier and Age of Ultron. Tony made a massive mistake creating Ultron, and his guilt has caused him to take a diplomatic seat among the Avengers, now led by Steve. Winter Soldier ended with a brainwashed Bucky finally appearing to break away from his mental capture, and Bucky started to find himself again. After , they must submit to a UN-approved set of rules Avengers must follow in order to keep fighting for good. Tony agrees with the UN (and William Hurt’s Secretary of State) that they need oversight, but Steve feels they need to operate outside government control. Like Batman v Superman, the tension is largely over the cost of collateral damage. Can society stand the taking of even one innocent life in the unending fight for peace? And the most interesting split over the ideas are those Avengers with a military background (Steve, Sam, and Rhodey). Rhodey’s belief that they need to answer to someone is met with the response that they don’t want to pass their blame to a larger body—they have to own the cost of those lives they take (even if by accident), but Steve and Sam still seem to feel those lost lives are worth the cost to protect the world as a whole. It’s the surprisingly pragmatic side of an earnest soldier from WWII thrown into the 21st Century that makes Steve Rogers an interesting character in these films. The moral-ethical ideas in those conversations, along with the larger ideas of Vision, logical Natasha, and emotionally raw Wanda that makes the idea of an ideological split so interesting. Tony being in this conversation feels somewhat out of place … as do most of his standalone (showboating) scenes. For example, when Wanda is devastated (and Elizabeth Olson proves how beneficial she is as a part of this ensemble), they immediately cut to Tony (and a really weird use of flashback), and undercut Wanda and Steve’s emotional moment. Again, during that interesting ideological debate, rather than let the debate play out, Tony grandstands and somehow wins the minds of soldiers and agents who apparently never thought about these innocents. The fact is, as good as Downey is as Tony (and this is one of his better outings as Tony), his forced importance as leader (and costar) seems out of place almost immediately. He tends to dominate scenes, and all the scenes when the audience is simply asked to follow him feel like they’re from another Iron Man movie. Part of me feels like Stark should have taken the place of the absent Nick Fury in this film, more elder statesman than rival leader. The movie ultimately feels rushed into the Civil War storyline. Rather than finishing the Winter Solder storyline and allowing the film to lead into Civil War, they are mixed in and get muddled. Why do we need Civil War right now is the big question? Why not let Steve and Tony’s tension build in this film into such an ideological and personal rift it feels like their relationship will be impossible to repair? As it is in this movie, the split and where people fall feels somewhat arbitrary, and based on where people end up in the film, that seems to be the case. I know you might wondering why a two-minute scene bothered me so much. It’s because Tony’s “flashback” is unnecessary and therefore calls attention to itself. If anything, these are films that can shortcut some elements, but preferably by adding more character moments. We get very, very few hangout moments with Steve and Sam (and Bucky), but they are some of the best scenes in the movie. Natasha, after being so great in Winter Soldier, is underused but still rocks (and thank goodness we don’t have a love story from Age of Ultron hanging over our heads). Wanda and Vision flirting is a little awkward, but they have nice chemistry, as do Sharon and Steve (one of the few Marvel love stories I’d be interested in seeing more of). But often times, the film fills time with a lot of action—fortunately a lot of great action. I don’t know who made the demand that most of Marvel’s action sequences be filmed during the day, but I like the decision for no other reason than the fact that I can enjoy the spectacle of the whole thing, and the Russos have turned into some of the best action directors of the decade. I would argue there are at least four action sequences in this film that rival what they did in Winter Soldier: a chase, a hand-to-hand fight, the opening mission, and the closing brawl. As for the big fight in all the trailers? It’s good—really good—it just goes on too long and doesn’t have the visceral or emotional impact of those other fights. The stakes of those fights are felt throughout the film. As fun as the big Civil War fight might be, I never knew if the mission was to kill or incapacitate their rival Avengers. Maybe it’s all the quipping from Spider-Man. Tom Holland is great, and his Spider-Man is a character I can’t wait to see in his own movie, but if this is the fight to end all fights, having EVERYONE throwing around quips undercuts the impact of that scene, which ends up just feeling like something done as fun eye-candy that delights in destruction. It kind of defeats the central collateral damage debate. But the Russos are excellent at staging hand-to-hand fights, using stunt people brilliantly and showcasing their cast’s abilities. I feel like Steve Rogers (and Chris Evans) couldn’t have been paired with a better directing team. 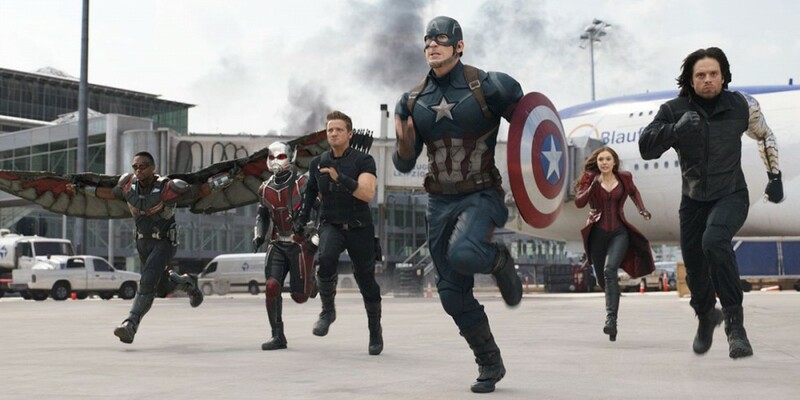 The Russos’ signature from Winter Soldier was the fact that they made clean, fun, and thoughtful action movies closer to the best action films of the ’80s and ’90s—before computer technology dominated. Yes, their films don’t shy away from CGI, but the practical effects set their previous film apart. That isn’t as strong here, because they’re naturally required to have so much CGI. The visuals of the more CG heavy characters are a bit off, although unlike many action films, Marvel does manage to create more impact with buildings—they seem to fall with the deep impact of realism the way too few films ever do—but one of the reasons this movie works as well as it does is the conflicts remain insular and personal, rather than suggesting the world is at risk of total destruction (yet again). When the biggest (and most emotional) final fights are just between a few characters we’ve come to know and like over several films, the emotional investment is high. The movie is most definitely fun, and that’s a big reason the problems I have with it don’t stand out as strong as some of the darker, moodier action films we get. A light touch and high energy can keep a film afloat even when it struggles, and I’d like to re-watch this film and see some of what I missed and how the story actually builds and unfolds with the knowledge of the ending. But I’d be lying to say I didn’t find myself a little disappointed by the storytelling here, especially as Marvel begins stage three of its cinematic universe. The rushed and crowded feeling of the film, inability to show patience and really build up the conflict between the Avengers, and at the end hurts what could have been a suburb sequel to Winter Soldier, even if it is still one of the best Marvel films to date. Anthony Russo, Captain America: Civil War, Chris Evans, contributors, Joe Russo, Marvel Entertainment, Robert Downey Jr.